What are you designing right now? What do you think about the actual ASME code? ASME Sect. 8, Div. 1 & 2 were written way back at the dawn of engineering time, long before digital computers were dreamt of. It is arcane, overly complex, badly written and organized. In recent years ASME has slowly woken up to the real world of digital computational engineering and made some small concessions, but really, it needs to be junked and re-written to reflect modern reality. For example, they now permit some level of FEA to be used in areas surrounding vessel supports, lugs and brackets – but it is quite constricted – and those areas are exactly where most of the interesting stress problems arise. The big problem, since much guesswork and empirical experimentation was used to develop that code with section after section being added-on, is that it is very conservative and therefore vessels come out rather heavy, and expensive. In my career, I have tried to avoid it altogether, but we have a more senior engineer in our office who has spent his career in large vessels and, when necessary, I ask him for advice on which section, sub-section, page, UG chart and Div. 2 table, etc., etc. to use, and even then it is painful. He uses FEA constantly as a check on what the ASME code numbers say, and if there is a conflict, I know he leans to the FEA results side. What is the difference between lab equipment and much higher pressure vessel used in industry? By comparison, lab equipment is generally small, generally much higher pressure, and is not governed by any code whatsoever – there is far too much diversity of design for that. The engineer is then left to his own devices and experience. In thirty years of working with FEA software and taking this approach to small vessel design I have yet to have one blow up or even crack out on me – the result of careful consideration of Margins of Safety and other factors. The same goes for (non pressure vessel) oilfield equipment generally. In that world there are fewer constraints outside of general directions for MAWP (Maximum Allowable Working Pressure) and test pressures, such as those defined by API (American Petroleum Institute and the SPE (Society of Petroleum Engineers) allowing us the freedom to pay attention to the details we know are important. Models are great for pointing out weaknesses that need to be beefed up prior to a physical test. They are really good for finding design bottlenecks that can be corrected prior to putting welder to metal. BUT, at the end of the day you have to build the vessel and break it. I’m seeing a lot of areas where people are replacing testing with FEA and other computer simulations. Sometimes with disastrous results. When you call modeling “proof” you get bad engineering, bad science, and horrible regulations. I understand where that contributor is coming from – he is referring to the practice of Test Validation of every design – probably due to a fundamental lack of confidence in the software. Twenty five years ago, when we started using FEA (back when it was all 1’s and 0’s for turning the program flags on and off), yes, we did some validation testing because the technique was new and the entire engineering community, being a conservative bunch, tended to distrust their results and tested quite a bit. The last major validation test I ran on a model for the housing on a high-pressure downhole tool outer casing came in within 2% of predicted collapse values – not bad. The FEA design cost a couple thousand and the testing something like $25,000. Those days are gone. Today, for standard designs with known equipment, testing is the exception, not the norm, and I can tell you for sure that nobody in the pressure vessel industry is “building and breaking” multi-million dollar vessels. Why? Because the FEA codes are so good, so well understood and validated and produce results that are consistently accurate and predictable that few bother with expensive and time-consuming validation tests any more. 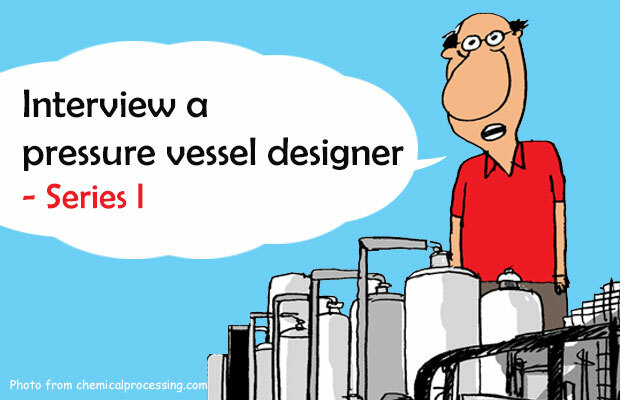 Do you think FE Analysis is a good tool for pressure vessel designers? Of course, like any good tool, to get the most out of it, you have to know what you are doing. So, for example, model mesh quality is important. You have to pay attention to detail in areas of high stress concentration. And, you can’t just use a coarse mesh and assume that you are getting anything like realistic stress numbers. So in your opinion, what would be the right approach to be able to obtain accurate results from FE Analysis? In there you will find the key to accuracy – minimising the difference between the Elemental and Nodal results (also called “Averaged/Un-Averaged” results). When that gets down to less than 5% you have an acceptably accurate stress result. It is the only standard for this I have seen, we use it here routinely, and I would recommend it to anyone seeking better results.” Also, you will be making decisions on the relevance of using the Von Mises (root/sum/squared) stress paradigm or Max Principal stresses – depending primarily on your judgement of the orientation and level of the Shear contribution to the stresses. Any final advice for those in PV industry who want to go for FE Analysis? One final point I would like to make: If it is properly understood and used by well trained engineers/technologists who are careful and prudent with their choices, FEA is a wonderful tool, freeing us to create new designs, the performance of which exceeds what was possible in the past thanks higher levels of knowledge of their limits and accuracy of results. It is why we can now confidently build drilling tools which break new ground at 35,000 feet beneath the ocean floor or probe the depths of the Marianas Trench, how Carbon fibre composites can simultaneously strengthen and lighten large aircraft, how the engines for those aircraft can be designed to burn very lean mixtures to improve their thermal efficiency beyond 50% – all of this is possible today thanks to the digital computer and advanced FEA software. Thank you very much Gerry for those valuable insights! Do you think that Gerry is Right? “Devil is in the details”. I am not against FEA I use it really often for design verifications, but… I saw many designs nicely simulated as excellent nominal geometries with results matching hand calculations pretty good. However, after revising final technical documentation of the same structures you may notice many areas of possible human errors. Ignorance of manufacturing tolerances of sheet metal base materials, mistakes in welding symbols, welding strategies, welding spacings, maintenance plan etc. That’s only design considerations. Lets go now to manufacturing process bottlenecks, we are talking about welded structures so try to estimate risk on welding -> that’s all about human mistake/negligence related risk factors. I think that already you may consider that I am moving away from subject, but c’mon this is all about our safety, in my opinion damage test on new designs is a must, because only by such testing you can be sure that your product and production processes are delivered with full excellence, so you can be proud of this and be sure fake similar products do not compete with yours. So please do respect old good regulations even if over dimensioning is the fact. If you have good reasons to change safety regulations, you can always give proposal to people that update revise them. ASME VIII Div.1 is not that bad. Actually, it is good to use. All you need is go though every line very carefully to get the answer you want. Nice Blog! I agree with most of what has been said, however there is a real danger these days that Engineers with little experience carry out an FEA and just assume its correct. Modern design packages make it so easy to model a vessel and then “Oh look we can press this button and get an FEA!” They do not understand the results, they do not refine the model, and they do not know how to check against appropriate code allowable stresses! I have downloaded the AB-520 paper, that looks interesting! I wonder if a section should be put in the codes on FEA and how to use it properly! Thanks John ! What you say is really true and this is one of the purpose of the blog to make people realize that the accuracy of the results is important ! Apart from comparing FEA with ASME Sec VIII Div 2, the ASME code has serious problems, technically, economically and structurally. If I want to describe my experience with ASME Sec VIII Div. 2 I should say that, unfortunately, it is a considerably ambiguous text that not two person can agree on their interpretation from it. For instance, the section about primary and secondary stress and ways to discriminate between them is an absolute ambiguity. This requires to to spent 30 times more time on the codes compared with even most difficult textbook in area of damage mechanics. In addition, there is no link between the advancements in mechanical engineering in the area of damage and fatigue that provided us with reliable methods to predict fatigue and fracture with what ASME offers. Sec VIII Div1 and Div2 simplifies whole mechanical engineering by using a so called allowable stress which is calculated by dividing UTS by 3.5 and 2.4 for Div1 and Div2, respectively (or yield stress/1.5 for both). That is why those codes have been and will be not technically popular at the eye of a scientist. Last but not least, since this code is used as a government regulatory check, it must be much more clear in contents and approaches it offers. I wonder if Gerry I had even looked at the new (well, actually, it is now eight years old, but still…) Edition of Division 2? It’s as modern a Code as exists in the world today. That said, I completely agree with his take on testing vs performing FEA. The experimental backup to the Code FEA rules is extensive and comprehensive. And provided that one uses the more modern elastic-plastic analysis methods, the likelihood for user error is smaller. Those who advocate for more destructive testing obviously are not aware of the size, scope, and cost of some of these pressure vessels. As far as comparing lab equipment to commercial vessels, of course I would expect the commercial ones to be thicker/heavier because the consequences of failure ate so much more – hence the specified design margins in the various Codes. Is there a scientific basis for the hopper diagram/stress linearization? Maybe things have changed, but no FEA vendor when I looked had implented it and a college professor of mine accused me of drinking the kool-aid by believing it. Jeff — the stress linearization made a lot more sense decades ago when we had to be stingy with the computational power. However, it still comes down to the engineer knowing how to use his tools and justify his assumptions and conclusions. Mohsen, elastic stress analysis is an absolutely brutally lousy method for evaluating pressure vessels. It is not the fault of the ASME Code in this regard, but the elastic analysis method itself. You are aware of paragraphs 5.2.1.2, 5.2.1.3, and 5.2.1.4? Also, Mohsen, if you claim that the ASME Code reduces ALL of mechanical engineering down to an allowable stress, then I would suggest that you don’t actually understand the Code, especially the Design By Analysis portions. You are using the latest edition? There is the latest in damage mechanisms: Structural Stress Method for the Fatigue of Weldments. Jeff, have you personally gotten involved in the ASME Code to make the (in my opinion unsubstantiated) claim that there are so many special manufacturing interests involved? Involvement is open to anyone, so if you have a problem, get involved and try to fix it. Give it to the military? Seriously? And the major insurance companies are, in fact, involved in Code development. As far as whether there is a scientific basis for the Hopper diagram, read ASME PTB-1. It’s all there. Almost 50 years of technical background and experience. As far as college professors, I’ve seen the technical work that many do in technical papers at venues such as the ASME PVP conference; some of it is unadulterated crap. Industry is putting out better technical material now. Do you consider Elastic Stress Analysis lousy due to incomplete data/bad models of the base material? I haven’t look at that code for a few years, are there any approved models that incorporate Fatigue, Elastic Limits, and any other non-linear affects? No, I consider elastic analysis lousy because of the reasons explained in 5.2.1.2, 5.2.1.3, and 5.2.1.4. Interesting, Jeff, that in one post you call the ASME Code a “piece of crap” and then in a subsequent post you admit that you haven’t looked at the Code for a few years. Check it out for yourself and see the answers to your questions. Mohsen – so how would you fix it? Trevor, expecting ASME to catch up with latest innovations in area of elastic-plastic and damage is a valid criticism but sounds unrealistic and someone could question its necessity. Any text should be completely clear for the reader. Even in some universities, students in graduate levels should pass courses mostly called as “effective scientific language” to enable them to write effective scientific texts rather than something like Shakespeare’s poems. You should be able to see from many scientific papers that most of them are with a good degree of “readability” because they are reviewed comprehensively not only for technical issues but also for structure and their communicative language. That means that the authors must put the effort to make his work easy to understand. The fact that the code is mandatory for many industries, should not play as a shield that exempt ASME committee to review the code for aspects beyond technicality and authoritative language. ASME code, fundamentally, represents decades of scientific work. When you submit a scientific paper for publication, your paper can be simply rejected if it does not speak clearly, regardless of scientific contents. That is a fact. As a reviewer of some of the high ranked scientific journals in my field, computational mechanics, I am sure that a paper with the language of ASME BPVC would be rejected right away for its difficult language or if by any chance it passes the review process, very few people will read it. Finally, my suggestion, the committee can hire engineers from different levels to review the code language till all of them tell that, yes, it is a clear text and majority of engineers would not get headache after reading it. Mohsen – what, specifically, is latest in elastic-plastic analysis that isn’t covered in 5.2.4, 5.3.3, 5.5.4, and 5.5.7? And the local failure rules in 5.3.3 are very cutting edge. It is true, that the wording of the rules may be a little awkward, but that is a result of the “consensus” approach – each sentence/paragraph has to be reviewed and vetted by no less than 80-100 people, each with a different “style” to their writing. One thing that I will note here is a fact that you yourself mentioned – that the ASME BPV Code is law in most North American jurisdictions. Essentially, that means that the Code IS law. Have you read through any of the laws in your country/state/province/city? They are not what I would call paragons of “readability”. Well, several of the Code Committee members represent their provincial/state jurisdiction – that means that they are tasked with enforcing the rules/regulations. So, their input on what is good Code/law language makes it different from a good readable scientific paper. Trevor, I am absolutely aware of those sections since I used them for my clients. As a developer of new phenomenological models for metals, I can assure you that ASME code is way behind current models. Besides, as I already stated, even for simplest criterion in the code, there are so many ambiguities in structure and language. Jeff, as regards with damage, there are models such as MMC or EMC developed at MIT. They are the most advanced damage models so far. On the other hand, we also know that anisotropy plays a crucial role in both thin and thick metal’s elastic-plastic and failure behaviour. There are models available that incorporate anisotropy wery well. You can read my publications in that subject that very clearly describe the new trends. I also described algorithms to incorporate those new models in FEA. It is adopted because it works. In many places, it is mandatory. Arguing it you feel it is arcane or hard to use could be seen as indicative of a carpenter blaming his tools rather than owning his own lack of skill. For a pressure vessel engineer working in North America, if he/she can not fully understand the code requirement, he/she shouldn’t be using FEA for the design either. ASME BPVC VIII Div.2 post 2007 is one the most advanced and practical Codes in the industry (I reiterate, industry and not R&D). You need to use other Codes to realise what a wonderfull job ASME has done. It is not perfect but it is much better than any other Code I have come across (PD5500, EN13445 etc.). Where can you find a Code like this in other industries such as Car or Aircraft? The Elastic-Plastic methods in the Code are quite clear and practical for somebody who knows the concept of Pressure Equipment, Elasticity, Plasticty damage mechanisms and finally FEA. It is not intended for university students or researchers who have no experience with the Equipment design. The Stress Linearization is based on some well proven concepts and served the industry for many years when Non-Linear analysis was prohibitive due to time/cost as well as software limitations. Nowadays, every uni student has access to state of art FEA program and most of them don’t even know the difference between Node and Element (I am not referring to complicated solution algorithm in nonlinear analysis!). To understand the concept of stress Linearization, primary/secondary stresses, just search for names such as “Roche” , “Dhalla” and read their papers. The method though is far from being perfect, has worked for many years and it is just in recent years that Elastic-Plastic has started to replace it.